Our suggestions for the best way to wash your makeup brushes and how often you should routinely clean them may surprise you. Spoiler alert: It’s a lot easier and less time consuming than you may think. Some people will tell you that you should wash your makeup brushes weekly or even daily. If you are a makeup artist, that makes sense, but for the rest of us, once a month is just fine. Yes, you heard us right, just ONCE A MONTH. 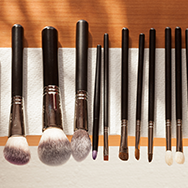 Some of you might also wonder: “Will dirty brushes make me break out?” The simple answer is NO. The type of bacteria that cause acne cannot survive on a makeup brush. Also, keep in mind that frequent washing can break down the brush hairs (especially natural-hair brushes) and loosen the glue in the handle that holds the bristles together. That said, you do need to wash your brushes every so often to remove built-up makeup, oil, and other debris that cling to hair. This will help ensure smooth application and allow your brush hairs to maintain their shape and flexibility. Do I Need a Special Brush Cleanser? We’re going to save you some money here: Buying a brush-cleaning solution is not necessary. A regular (non-conditioning) shampoo or water-soluble (non-creamy) cleanser will work just as well if not better. Think about it, if shampoo works for your hair, why wouldn’t it work for brush hair? Two of our Paula’s Choice staffer favorites are the ALL OVER Hair & Body Shampoo and the HYDRALIGHT One Step Cleanser. Both are extremely effective at removing built-up residue and debris from your brushes. What’s the Best Way to Wash Makeup Brushes? Here’s a step-by-step guide to get the best results. Keep in mind that it may take several hours for your brushes to dry, so it’s wise to start the process the evening before to ensure adequate dry time by morning. Add your cleanser of choice to the palm of your hand and gently swirl the brush to wash the hairs. Meticulously and thoroughly rinse the brush, again making sure the excess water is not running toward the ferrule. Carefully press out the excess water and dab the brush dry with a towel. Arrange the bristles back into their original shape. What if You’re Short on Time? The method above ensures a deep clean, but if you’re short on time, there’s a makeup artist secret that can speed up the dry time. Instead of washing your brush with water and cleanser, saturate your brush in 91% alcohol to quickly sterilize and remove built-up makeup residue. If it’s been a while since you last washed your brush, this method likely won’t be thorough enough to completely clean it, but it will get you by in a pinch and it’ll dry much faster than the method above.